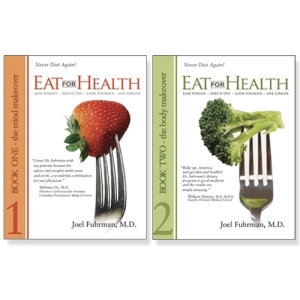 One of the best informational books available is Dr. Fuhrman’s book, “Eat To Live”. this is a New York Times Best selling book from one of the leading authorities of how proper nutrition can overcome diseases and illnesses, like Lepus, Diabetes, heart disease and more. He explains in depth how just slightly adjusting your daily diet will promote a healthy immune system, how to lose weight and live longer. His dedication to proper nutrition has allowed him to do many quest appearances on TV like Dr. OZ show, 60 minutes, Martha Stewart, and countless other engagements. His explanations are easily read and understood with details plus a whole chapter of successful stories from people who have followed his advise, that are now living healthier and happier lives. A book that should be in everyone’s library. This is a New York Times Best Seller that will let you live longer, reduce your need for medications, and improve your health dramatically. It is a book that will change the way you want to eat. Most importantly, if you follow the Eat To Live? diet, you will lose weight faster than you ever thought possible and never gain it back. I recently had the chance to review this book, and man, I have to tell you, the information I received out of this book is truly incredible! I did not know many of the little details Dr Fuhrman talks about for the reasons people get sick, or catch chronic, debilitating diseases. So let me give you my two cents worth of recomendations about this book…. 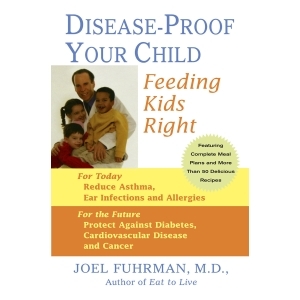 Dr. Fuhrman has been an advocate of alternative medicine for years. He has countless testimonials from patients, mostly women, which bear witness to his doctrine of beating diseases by eating the right foods. Today many doctors prescribe medication that only treat the symptoms of many ailments, such as high cholesterol, high blood pressure, diabetes, aches and pains, dementia, acid reflux, just to name a few. But these medications are not treating, or eliminating the root cause of these ailments or diseases. They are only masking the symptoms, which give you a false sense of relief that you are doing something good for your body and health. The analogy Dr. Fuhrman uses is that of an auto mechanic…Your car has the “oil” sensor light flashing red on the dashboard of your car. The sensor light indicates your car needs oil. You take the car into the mechanic to fix your car. The mechanic simply cuts the wire that is causing your sensor light to flash. Did this mechanic fix your car? NO! The same truth goes for the medication you have been prescribed. The medication is only treating the symptoms, and not the root cause of your condition. These medications are like the doctors writing you permission slips to continue to live how you have been living. You may actually feel temporarily better for now, but your ailments or diseases are advancing, not getting cured. This is the main reason we have the health-care crisis we have today! Dr. Fuhrman goes on to say that the majority of medications prescribed today to treat diabetes, high blood pressure, high cholesterol, allergies, pain ,etc, are not only not needed, but they are only making the problems much worse. For example, when you are taking diabetic medication, one of the side effects is you gain weight. Eating healthy foods and weight control are closely intertwined together, in which when you eat the right foods, you stop the advancing disease as well as naturally reducing your weight gain. Forget the old food pyramid that the FDA has given us to find appropriate foods that are healthy. The FDA is not our friend. The FDA is in business to make money. When they approve a new drug to be marketed, they make a lot of money from the drug companies. The drug companies get rich along with all their affiliates, the FDA, and doctors that prescribe these medications. 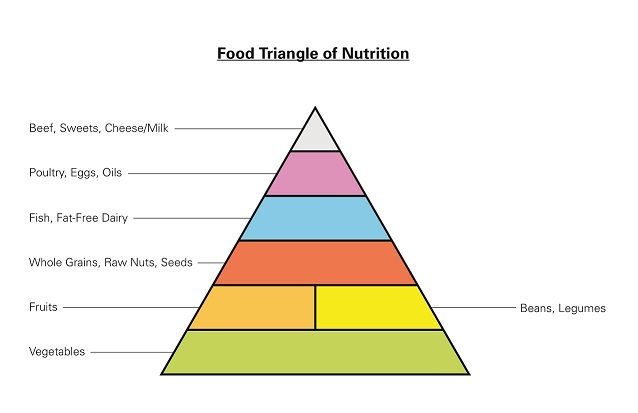 The new food pyramid has “vegetables” listed as the base of the triangle. These foods have the most nutrients our bodies need. Vegetables are the most important food group. Strawberries for example, have over 700 micro-nutrients in which to aid our bodies in the fight against diseases. Broccoli, has over 1000 micro-nutrients. So you ask is this just another new “fad-diet-plan”? Absolutely not! You can’t separate weight lose from health. When you eat foods that have the most anti-oxidants to fight against cancer, you inhibit fat growth in your cells. By inhibiting fat growth at the cellular level (detoxifying your body), you stop weight gain and stop cancer cells from growing; you unclog your arteries, stopping heart disease and high cholesterol. To help remember these important food groups, Dr Fuhrman has come up with an acronym – G-Bombs. These are the most therapeutic, nutrient-rich foods that your body must have to fight off diseases. While fighting off diseases, these foods also will aid you in controlling weight gain. I hope you can see why I highly recommend this book. It is for the novice as well as for the pro. Do yourself a favor, Buy This Book, I promise you, you will not be sorry! Dr. Fuhrman presents fascinating science demonstrating how the current epidemic of adult cancers and other diseases are closely linked to what we eat in childhood. He explains how a nutrient?rich diet increases a child’s resistance to common childhood illnesses like asthma, ear infections, and allergies. He illustrates how eating his nutrient?rich diet during childhood is the most powerful weapon against developing cancer, cardiovascular disease, and autoimmune disorders in the future. I cannot recommend this book enough, it changed my life. You know Phil every time I read from this book, I get a deeper understanding of his philosophy. I wished that this book would be adopted as the “Go To Reference” book for the United States in helping citizens overcome their “sad diet”. The Sad Diet leads everyone chronic illnesses and diseases and an early death!